��� Monster films, in all their various guises have been a mainstay of cinema since it began. Shark movies specifically have also been around for quite a while, brought to mainstream popularity by the Jaws series starting in the 1970s. More recently we have seen the low budget Sharknado series and mainstream films like The Shallows and Deep Blue Sea. So what can a film like The Meg hope to add to this genre? In terms of new story ideas and plot points it doesn't add a whole lot but it is certainly an enjoyable, funny and well put together film for a B-movie. It does now sit in second place only to the original Jaws on the "Terror in the Water" box office comparison list at boxofficemojo.com and took over $500M at the global box office so it must have done something right. � � The story, such as it is, kicks off with an undersea rescue led by Jonas Taylor (Jason Statham) who makes a tough decision which results in the death of some of his team. Despite his claims of a massive shark attacking the vessel, he is not believed and is widely considered to have made a bad call. He leaves the undersea rescue business and spends his life in Thailand drinking heavily and running a small boat business. Some years later, an oceanographer, Zhang (Winston Chao) is leading an expedition to uncover the secrets of the deepest ocean trenches. He believes he has found a deeper trench than the Mariana which is obscured by a layer of cold gas suspended in the ocean which everyone has believed is actually the bottom. His team including his daughter, Suyin (Li Bingbing) and Jonas' ex-wife, Lori (Jessica McNamee) are trying to get under this layer. Lori leads a mission to dive through the layer and investigate, however, they are attacked by a massive creature and need to be rescued. Cue the ex-husband, washed up undersea rescue expert who must be brought in to rescue the team, despite his misgivings and those of the Doctor in Chao's crew who was involved in the previous rescue. Naturally, the gigantic creature and the shark which attacked the previous vessel are the same and the rescue results in The Meg (or Megalodon, a believed extinct 30 metre prehistoric shark) being released into the open ocean. Havoc ensues! Other cast members include Rainn Wilson, as the billionaire investor who happens to be visiting, Cliff Curtis, Ruby Rose and another Aussie Robert Taylor. � � As I mentioned above, there are lots of cliches in the story but that is to be expected with this sort of film. What this film does deliver is a quality action star, some fantastic action scenes, great visuals, fun and excitement. I had a fun time with this film and my teenage boys want to watch it again. It is not great art but it is very entertaining. The special effects are generally very well done, although you obviously need to suspend your disbelief. It is a China/United States joint production with longtime Hollywood producer, Lorenzo Di Bonaventura leading the way. The film was directed by another Hollywood journeyman, Jon Turteltaub, probably best known for the National Treasure films. It was mostly filmed in the Hauraki Gulf, near Auckland, New Zealand. The music is by excellent composer, Harry Gregson-Williams who has certainly been busy lately with a slew of films released with his music over recent years. He now has over 100 composing credits in imdb. The cinematographer, Tom Stern, has been Oscar Nominated which highlights some of the quality people involved in this production. This is B-movie done right! � � �If you can suspend disbelief and want to have a fun time with a film, this is a well done creature feature despite its cliched story. Recommended! 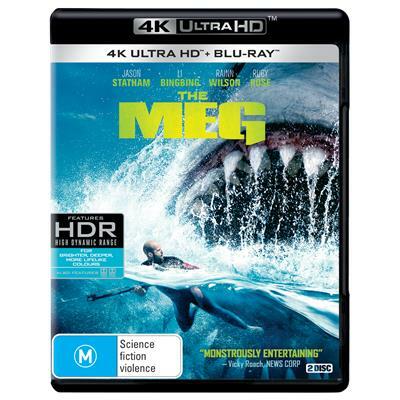 ��� This is probably the best looking 4K disc I have seen to date with stunning clarity, incredible colours and images which just leap off the screen. Water in 4K (whether it be waves, undersea/underwater shots, rivers, transparent coves etc) is one area where 4K really shines over Blu-ray. The added clarity and colour variation really make a big difference. This disc looks incredible when you just play it with normal HDR10 but when you turn on the Dolby Vision layer it is the colours which really benefit. It is actually hard to work out from the case that this disc includes Dolby Vision with only a very small logo on the front giving it away. The detailed tech specs on the back say nothing about it. It is a sight to behold in Dolby Vision, almost too clear and colourful at times, although that suits this style of film. ��� The feature is presented in a 2.40:1 aspect ratio which�is�the original aspect ratio in 2160p. It is encoded in HEVC and incorporates High Dynamic Range, Dolby Vision and a wider colour spectrum. The detail on the shark, the incredible colours both underwater and in the sequence involving lots of extras with colourful water toys really explode off the screen. Sequences shot from above with the shark underwater are also incredible. There is very little banding, which there is a lot more of on the Blu-ray (included in the case) but I did notice one spot around 59 minutes. Water droplets are highly defined and clear. This is the first disc I have seen which looks as good as Blue Planet II which was shot in 4K. This one was seemingly shot at 3.4K. ����There are�subtitles available in English for the Hearing Impaired which are clear and easy to read plus a huge range of other languages. ��� The main audio track here is a Dolby Atmos one (resolving as True HD 7.1 on non-Atmos systems). There is also a DTS HD-MA 5.1 track which is the default, although the Atmos is preferable even if you don't have all the speakers required. In addition there are Audio Descriptive tracks in Dolby Digital 5.1 (one with an American voice, one with an English one, which is a nice touch) plus other language tracks in French (2 versions), German, Italian, Spanish (both Castilian and Latin), Czech, Hindi, Hungarian, Polish, Russian and Thai all in Dolby Digital 5.1. ��� The audio is aggressive and fills a full surround spectrum providing lots of directional effects, subwoofer, atmosphere, swelling music and much more. The combination of music and subwoofer really builds up appropriate tension even though the shark is obviously fairly quiet in itself. ��� No extras on the 4K disc, the accompanying Blu-ray contains the following minor extras. ��� Very much a standard making of which covers casting, stunts, the rigs used, challenges of shooting on the ocean and in a tank. The cast and crew discuss the physical challenges of a lot of water based work amongst other things and behind the scenes footage is included. ��� A short featurette on the special effects and also how they designed the Megalodon which is a real thing which was extinct a long time ago. It covers skin colour and texture, water displacement and other details which had to be extrapolated from fossils. Not bad. ��� A short promotional featurette about filming in New Zealand. �� �A fun and entertaining creature feature despite its cliche-ridden story. ��� The video quality is absolutely stunning. ��� The audio quality is excellent despite defaulting to a lower quality option. ��� The extras are minor featurettes on the Blu-ray disc only.